A Beast Man Digimon that evolved from Terriermon and is a Hunter Digimon skilled in hunting. 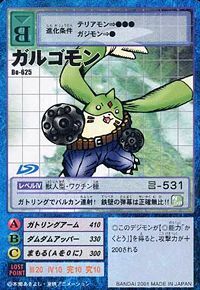 Despite its outward appearance, it uses attacks of unparalleled accuracy and its nimble movements to reliably bring down the opponent. 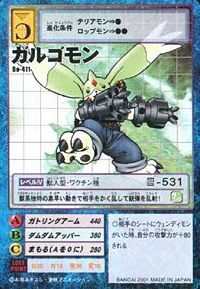 Its leg strength is strong enough for it to jump sky high, and it is also able to spread out its ears to glide. 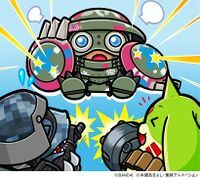 Although it usually has a cheerful personality, it gets out of hand once it is angered. It is obsessed with its cherished "D-VI'S 503xx" jeans. 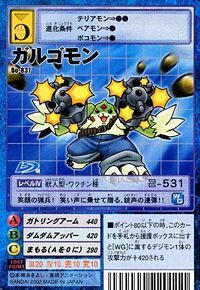 Its Special Moves are the vulcans on both of its arms (Gatling Arm), and getting under the opponent's bosom, then thrusting up a Gatling Arm from below (Dumdum Upper). | Galgo is a type of dog similar to a greyhound. Gargo is a corruption of galgo. 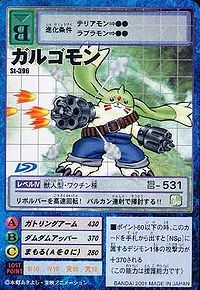 Gatling Arm  ガトリングアーム Gatoringu Āmu Gargo Pellets/Gargo Laser Fires bullets or lasers from both arms. 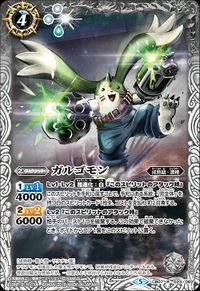 Dum Dum Upper  ダムダムアッパー Damu Damu Appā Bunny Pummel/Dumdum Uppercut/Animal Uppercut/Bunny Upper A powerful uppercut punch combined with Gatling Arm. 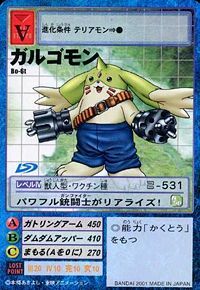 Galgomon is the partner of Wallace. 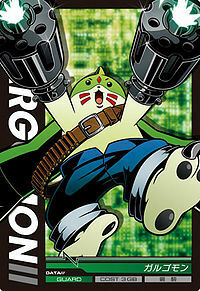 Galgomon is the partner of Lee Jianliang. 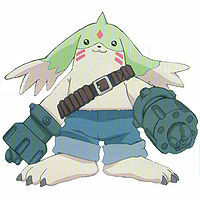 One Galgomon is seen during Jijimon's flashback about how the Digital World split apart. 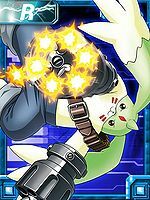 Galgomon is a non playable character. 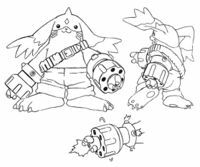 He is the weapon and armory shopkeeper, can be found in every city that have the stores. 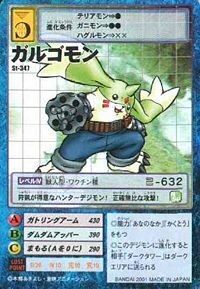 Can be evolved from Terriermon if above level 14 and Stress below 10%. 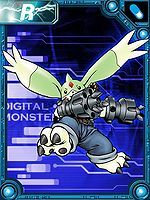 He can evolve to Rapidmon Perfect if above level 37, Black Rapidmon if above level 41 and Darkness EXP above 4000, and Prairiemon if above level 27 and needs to be holding the Digimental of Kindness. 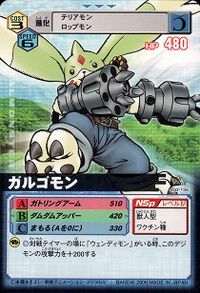 Can be evolved from Terriermon if above level 20, friendship 60%, and Beast EXP 480, or can be found at Regista Jungle. Can evolve to Rapidmon Perfect if above level 33, speed 145, and Machine EXP 3500. 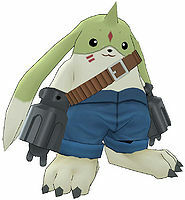 A skilled hunter Digimon! Its accuracy is unparalleled! Its revolver rotates at high speed! It mops up the enemy with a rapid fire vulcan!! It gets in under the opponent's chest and lets loose an uppercut explosion! It has the power to break even the ground!! 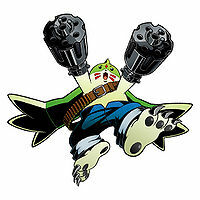 With sweep of gunfire from its Gatling Arm, it takes down any opponents that stand against it! 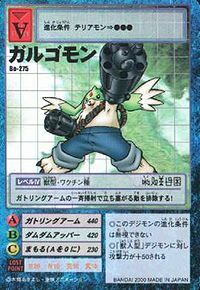 With the speedy movements of a beast type, it disorients its enemy and fires at it with its guns! It fires continually with its gatling gun vulcans! The accuracy of its iron wall-like barrage is unparalleled!! A hunting soldier with a smile! The sound of its laughter is drowned out only by the continuous sounds of gunfire!! A powerful gun fighter has Realized! 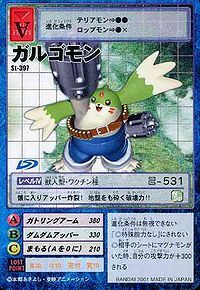 A hunter Digimon who specializes in hunting, its two arms are armed with gatling guns, and it possesses great jumping ability as well as speedy movements. Its favorite "D-Vi'S 503xx" jeans were made-to-order. 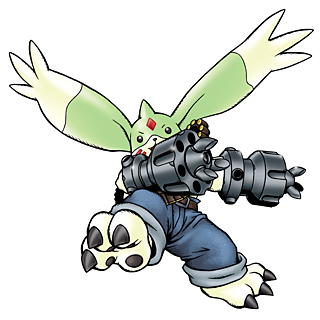 A Beast Man Digimon that evolved from Terriermon and is a Hunter Digimon skilled in hunting. Although it usually has a cheerful personality, it gets out of hand once it is angered. This page was last modified on 3 March 2019, at 04:19.